Having the right tool for the right job makes any job easier, right? Sometimes a “tool” is also a technique. Any job is easier when you know just how to manage it, and when it comes to quilting, truer words were never spoken! The whole reason I take a quilting or technique class is because if I learn just one thing that can make a task more successful, I feel it’s worth the price of the class! If you feel the same, then the HQ Hints book is for you! After years of taking classes, workshops, reading, trial and error, and asking dozens of other quilting professionals for their best hints and tips, I’ve compiled them all into one 60+ page home-made How-To reference and technique book!! You may ask.....exactly what’s in there? 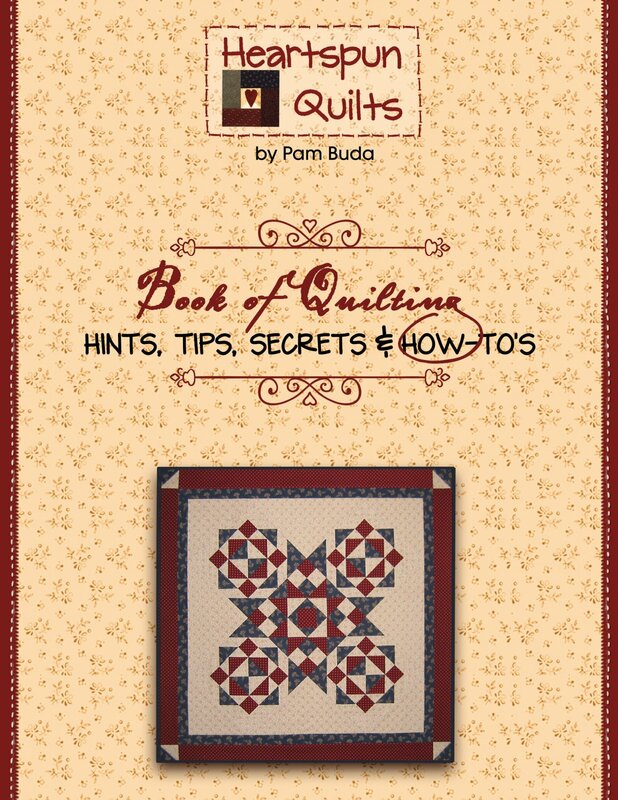 Loads of tips on a variety of quilting subjects. For instance, did you know that there’s a way to better prepare your fabrics to aid in accurate piecing, cause less stretch, and give crisp pressed seams? Do you know just how to check your ¼ inch seam or what will help you be more accurate? What’s the “correct” way to press? It’s all in the hints book! There’s an entire chapter devoted to understanding the basics of quilting M*A*T*H, which is a "four-letter word" to a lot of people. Included are Half Square Triangles and Quarter Square Triangles in 1/8 inch measurements, as well as Flying Geese units among others. You will also learn how to calculate how many binding strips you’ll need and how much yardage to buy for both straight and bias binding. You’ll learn new techniques for making the ever popular Cat's Cradle units and I’ve provided easy-to-follow worksheets so you can resize them to any size you’ll need! You won’t find that anywhere else but in my Hints book! There’s also step-by-step instructions on how to make units larger than they need to be and trim them down to the “perfect” size. Why bother? Well…perfect units become perfect blocks and go on to make more perfect quilts. Your quilt center is more likely to go together just the way it should, and be true & square with intersections that match and points in tact!! Another benefit? Kiss wavy borders good-bye! Included are instructions for “Make It Larger ~ Trim It Down” Half Square Triangles, Quarter Square Triangles, Flying Geese, Square-in-a-square units, and Side and Corner Setting Triangles. You’ll find I’ve done the math for you in easy to read conversion charts! I recently added a separate full color hand-out for working with silk thread. Silk thread is absolutely wonderful with hand stitching things like needle-turn applique, and for English Paper Piecing hexagons, pentagons and any other shapes. While silk thread is my favorite for hand stitching, it also can present some challenges, but not any more once you know these tips! These techniques have been over-the-moon popular in my workshops, and now you can benefit from them, too!! We’ve only scratched the surface though because there are chapters on Perfecting Connector Corners, and Becoming a Quilt Detective, so you can re-size your blocks and quilts. How about instructions on how to create quilt labels on your computer using matching fabric for your quilt (not the icky prepackaged stuff)? You can also make them by hand! Either way, finish with a fun and easy finishing technique, In the book you’ll also learn about choosing the right pins, needles, and thread, and so very much more. I’ve also included a free quilt pattern!